Apple reports its quarterly sales results today. Investors are braced for any sign that iPhone sales will keep slowing in the year ahead. 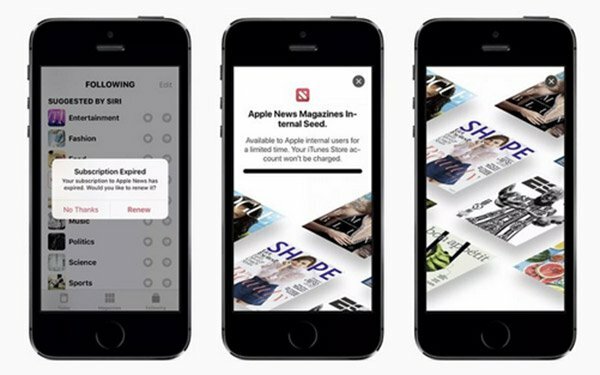 Publishers may get more insights into the company’s plans to sell magazine subscriptions through Apple News, which comes preinstalled on millions of devices. Apple News Magazines will be connected to the accounts of iTunes Store users, just like the company’s streaming service Apple Music, 9to5Mac reported after looking at the iOS update. Apple has many mentions of a “bundle subscription,” possibly indicating the tech giant is planning a service that combines music, magazines and TV shows. The company may introduce the service in March as it announces other products and services that are rumored to be in development, according to 9to5Mac. The website found a landing page for Apple News Magazines that indicates Vogue, Shape and Bon Appétit will be available in the digital newsstand, although pricing hasn’t been revealed. The website’s findings appear to confirm earlier reports that Apple seeks to create a “Netflix of magazines” that urges subscribers to pay a flat monthly fee for access to hundreds of digital publications. From there, publishers will determine what kind of value they’ll get from Apple’s global audience of more than 1.3 billion mobile devices. Apple News has about 90 million regular readers. Last year, it acquired Texture as part of a plan to create that digital newsstand. Texture had about 200,000 subscribers when Apple bought the company in March, according to Bloomberg News. Apple is looking for other areas of growth as the smartphone market matures and iPhone users hold on to their devices for longer periods instead of upgrading with each new rollout. Apple News is part of the company’s fast-growing services business that includes Apple Music, iCloud storage, Apple Pay and its Apple Care product warranty plan. The company may provide more details about these businesses today. Last year, it said it would stop disclosing iPhone sales, a decision that disappointed investors. Apple News Magazines may provide incremental revenue to publishers coping with declining sales and print circulation as ad dollars move into social media and search platforms provide greater scale for national advertisers. Publishers like Conde Nast, The New York Times, Dow Jones (publisher of The Wall Street Journal, MarketWatch and Barron’s) and the Financial Times have either put up paywalls or plan to do so to boost revenue.